We have had a very hectic weekend, with lots of visitors. Do you remember Ana and Elias? They came back from their trip to PORT DOUGLAS on Saturday morning, and their plane wasn´t leaving CAIRNS until the early afternoon, so we invited them over for lunch. I really enjoyed the time we spent with them again, a shame they had to leave so early. On Friday we hosted our first Couchsurfer in Cairns. Rita is from Portugal and is travelling around the world for a whole year before she goes back to her teaching life. It was absolutely fabulous meeting her, so many things to talk about and so little time. 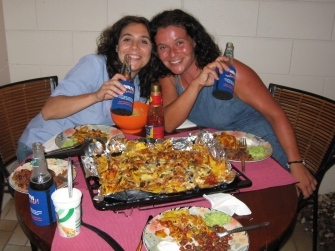 But I think we made the best of it, talking about nearly everything over a beer or a huge plate of nachos, as you can see in the photo. Those of you who had been to our place in Madrid for lunch or dinner will have already realised that Steve hasn´t changed and still cooks as if he had a whole army over for dinner. I must admit the nachos were delicious. And last night we met up with Nagore and Iñigo, Spanish couple who live in Texas and are in Australia on holidays. We met up with them to hand them one of our UNDERWATER CAMERAS the had rented for their REEF TRIP. I don´t know if you are aware that next Saturday Australia will elect a new Prime Minister. As you can imagine, politicians are going crazy with the campaign, like in any other country. But what has surprised me in Australia is how much money the two main political parties spend on TV advertising. And most of this advertising is not to so much about what they can do if they win the elections but what their oponent has done wrong or isn´t going to do. I don´t remember the Spanish elections ever beeing so cutthroat, but then I have never paid to much attention to them. Anyway, I have to go now, there´s a program about Harold Holt on TV now. Don´t know who Harold Holt is? He´s a celebrity in Australia but not only for having been Australia´s Prime Minister. You will find out more in my next blog and I assure you that it is an interesting story. See you soon!